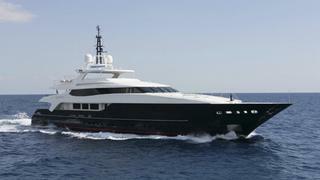 Virginia Putignani at Edmiston & Company is offering the 53m motor yacht Blue Scorpion for charter. She is both stylish and practical, hosting a full array of entertainment and amenities on board. Designed by Francesco Paszkowski, she boasts large indoor and outdoor spaces with a beautiful modern 'Zen' interior. Well-appointed cabins for up to 12 guests boast simple designs that incorporate the use of wood paneling on walls and ceiling, crisp white fabrics, Asian furnishings and traditional art. Blue Scorpion is equipped with an ultra-modern stabilization system, resulting in a smoother more enjoyable cruising experience. She is currently undergoing winter works which includes a new hull paint job.